Cost: $25-$40 – FREE Shipping! 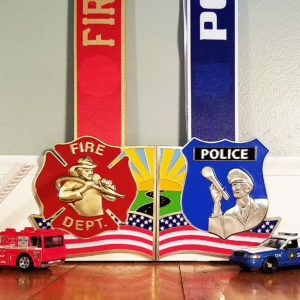 About this Virtual Run: We are doing something a little bit different with this event: Rather than having a virtual run to benefit one charity, the Battle of the Badges virtual 5k/10k/Half Marathon will support two great charities. Two 4″ medals are available to choose from – one to support the NFFF and another to support the NLEOMF. What’s even better? If you decide to support both charities by ordering both medals, they will interlock to make a giant first responders super-medal! In addition to making our standard donation for every medal ordered (see below for details), we are hosting an old fashioned Battle of the Badges during the race period. We will track the support for each cause and will donate an additional $1000 to the charity that receives the most “votes” through September 30th (11:59:59 p.m. ET, to be exact)! If you order BOTH medals, you will receive two votes that you can use to support the charity you prefer, or you can split your support between them. Take the Battle of the Badges Challenge! If you decided to register to support both charities, we challenge you to run or walk the distance you select TWICE to honor both the law enforcement officers and firefighters who put their lives on the line for us every day. See if you can beat your first time with the second and submit your fastest time when you upload your results. This is an entirely optional challenge. About the Charities: The United States Congress created the National Fallen Firefighters Foundation to lead a nationwide effort to remember America’s fallen firefighters. Since 1992, this non-profit Foundation has developed and expanded programs that fulfill that mandate. The charity’s mission is to honor and remember America’s fallen fire heroes and to provide resources to assist their survivors in rebuilding their lives and work within the fire service community to reduce firefighter deaths and injuries. Founded in 1984, the National Law Enforcement Officers Memorial Fund is dedicated to honoring and remembering the service and sacrifice of law enforcement officers in the United States. This nonprofit organization is headquartered in Washington, DC, where it built and continues to maintain the National Law Enforcement Officers Memorial – the nation’s monument to law enforcement officers killed in the line of duty. The Fund maintains the largest, most comprehensive database of line-of-duty officer deaths, conducts research into officer fatality trends and issues, and serves as an information clearinghouse. More recently, the Memorial Fund has launched a campaign to build the first-ever National Law Enforcement Museum to tell the story of American law enforcement through exhibits, collections, research and education. A portion of the proceeds from this virtual race will be donated to the NFFF and the NLEOMF. We will donate a minimum of $5 from each “Fire” medal registration to the NFFF and a minimum of $5 from each “Police” medal registration to the NLEOMF. When registrants order both medals, we will donate at least $5 to EACH charity, and registrants will be given two “votes” they can direct to either or both charities for the additional $1000 Battle of the Badges donation we will be making at the conclusion of the race period. Read more about how our standard donations are calculated in our FAQ. For more information about these two charities or to make direct contributions, please visit FireHero.org and LawMemorial.org.